Blackmagic Design continues to drive down the cost of professional grade cinema cameras while at the same time pushing the envelope for performance and workflow. 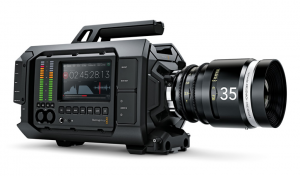 And with their penchant of announcing products at NAB, and with it being 7 months away, B&H has put the URSA 4K on sale to under $4,000. I can’t help but wonder what does B&H know? If Blackmagic if working on an 8K quad HD cinema camera, and that seems to be where the trend is right now thanks to RED and ARRI, then right about now would be the time to quietly reduce the price of their 4K platforms in order to clear out inventory to get ready for a huge announcement. And B&H dropping the price to $3,995 certainly makes the URSA way more attractive a camera platform. Frankly I think the coolest feature is the 10.1-inch Flip out LCD Screen. That, coupled with the ability to shoot in Raw and ProRes with 12-bit 4K in 4:2:2 with 12 stops of dynamic range and you have a serious player in the game. But Moore’s Law beckons and the window seems to be getting smaller. Not that this means that the URSA 4K is old hat, not by a long shot. It’s just that thanks to RED introducing the Weapon 8K upgrade with Vista Vision, it pushes the competition to keep up and that’s causing an cinematic arms race, one that some think is unnecessary. I’m not saying an 8K Blackmagic camera is happening — I have absolutely no idea. I’m just riffing on the timing of B&H’s price drop in regards to the window of opportunity as we head to NAB next Spring. More than likely, it’s just a generic killer sale that B&H is running. Still, Blackmagic has traditionally turned heads with shocking upgrade announcements and new products on the eve of the Las Vegas confab, so the dominoes may be lining up. Regardless, if you’ve been on the fence as to whether to upgrade your Blackmagic Cinema Camera to the URSA platform, now may be the time to pull the trigger. And while at it, you can take that $1,000 savings and put it towards going with the 4.6K sensor instead. Oh, one last thing. The $1,000 savings is for both the EF and PL mount versions, with the PL Mount costing $4495. Who Will Succeed Daniel Craig As James Bond?